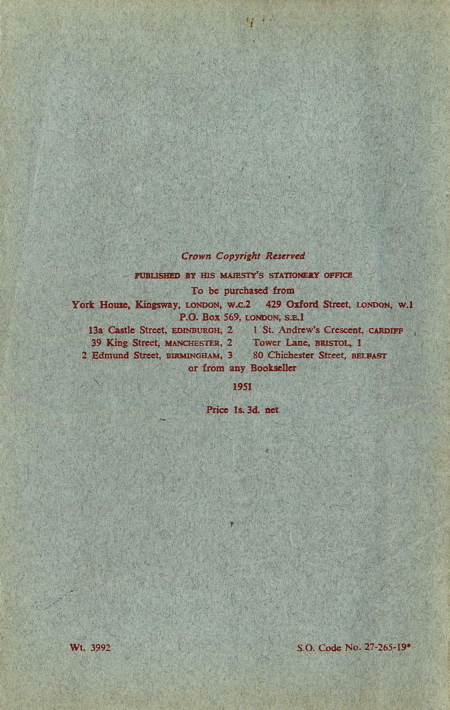 Published in the last year of Clement Attlee's post-war Labour government, this pamphlet set out the Ministry of Education's thinking on grammar schools, particularly its desire that pupils should stay on until age 18. The complete text of The Road to the Sixth Form is shown in this single web page. The Road to the Sixth Form was prepared for the web by Derek Gillard and uploaded on 10 March 2017. The present is a suitable time for reviewing some of the problems of what is usually spoken of as 'education of the grammar school type'. This is not quite the same thing as 'education in grammar schools', and the chapters which follow are aimed at the first and wider of these two themes which does, however, include the other. These chapters constitute a brief examination. in the light of present needs and beliefs, of what might be contained in the secondary education of the more intellectually gifted of the nation's children and of the spirit, methods and organisation by which this education is most likely to be successfully achieved. For several reasons, the circumstances of the present time make some such reflections necessary and profitable. 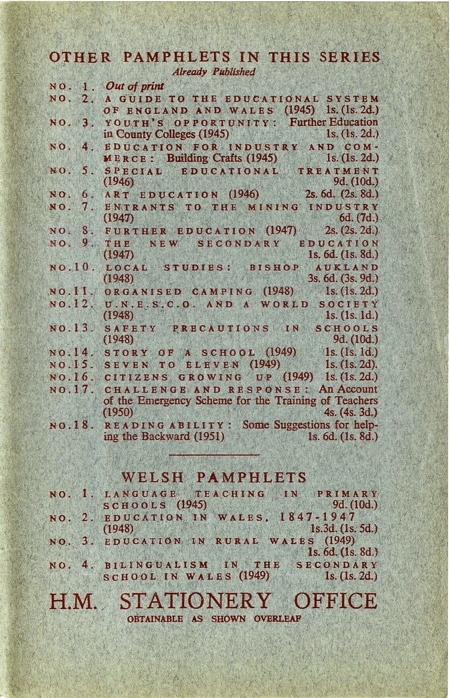 First, the development of alternative types of secondary education, begun before the Education Act of 1944 and strongly encouraged by it, enables teachers, administrators and parents to see more clearly than before the special distinguishing character of education of the grammar school type. The essentials of such an education are now more easily separated in the mind from the accidentals. What are these essentials and how are they best secured? Secondly, by the same token, it is, possible to see more clearly than before what common ground there might and ought to be between the education of highly intelligent children and of others not so gifted. Are there, for instance, matters of physical growth and skill, of manual dexterity, of aesthetic enjoyment and discrimination, of civic sense and social obligation in which a grammar school education is traditionally deficient, or, conversely, in which it is so rich that it has an inheritance to share with others? It may well be that in different respects both these questions may be answered with a 'Yes'. tive and financial problems and have raised large questions of organisation both of secondary education as a whole and of the internal structure of grammar schools themselves. As yet the aims and methods of this branch of education have not been closely or deeply examined in relation to the human needs of the pupils. But, within the last year or so, several interesting short examinations of the problem have appeared and the present pamphlet has been assisted by many wise and suggestive passages from these publications. The grammar school throughout these pages is the grammar school in England. The grammar school in Wales has its own distinctive tradition, which owes not a little to England but can claim other elements too. Thus much that can be said of English practice will be found to have its analogies in Welsh practice but the differences are real and not to be forgotten. Finally, the establishment of the general certificate of education has offered the schools new opportunities to review and revise their organisation to meet conditions of greater freedom and flexibility. This is perhaps the narrowest reason for the appearance of this pamphlet at this time. But it is also the most topical and it may commend the discussion to some who feel that urgent practical problems must first be solved if deeper issues are to be faced without haste and with some prospect of success. Many more *boys and girls than formerly have in recent years been staying on in their secondary schools until the age of eighteen or so. This development is welcome since it is evident that the nation needs a far larger number of highly educated boys and girls capable of work which would be beyond them without a general education lasting at least until eighteen. The need has been emphasised again and again in the last ten years, in such official documents as the Norwood and Barlow Reports, the Report of the Secondary School Examinations Council, Circular 192 of the Ministry of Education, and unofficially on many other occasions. The universities rightly wish to be assured that they will be able to draw on the most promising potential students, such professions as nursing or teaching already expect most of their recruits to be at least eighteen when they begin their professional training, and in other professions too, as well as in industry and commerce, the advantages of extended full-time schooling are coming to be recognised as never before. *It should be noted that the terms "boy" and "master" are often, though not always, used to denote "boy and girl" and "master and mistress". The longer expressions are sometimes used but too much repetition of them would be intolerable to the reader. any depth, he cannot afford to break it off at 16 or so. The many who still feel they must leave school at this age can pursue their studies in other ways, but those who do stay on at school are likely to have the best chance of all. An academic course especially can hardly hope to pay much of an intellectual dividend before the age of 17 or 18. At the present time most of the abler boys and girls are to be found in secondary grammar schools, and it is with these schools that the comments and suggestions which follow will be mainly concerned. They will of course apply equally to the appropriate sections or streams in multilateral, comprehensive and some bilateral schools. New forms of secondary education have also been developed in recent years and since the Education Act of 1944 their importance has been fully recognised; there is every reason to believe that as the newer types of secondary school establish their own traditions, the appropriate school courses, not necessarily academic in character. will gradually be developed. It should then become possible to stir the enthusiasm and touch the latent capacity of many other older boys and girls of a less academic turn of mind; these pupils, too, need their chance to learn more adequately and over a longer period at school what they most need to learn, and when the courses for them come to be developed, much that is said here will apply to these courses too, though in a somewhat different form. To review in these pages all the aspects of education which should be held in mind would be impossible; such a review would be either short and superficial or so long as to demand expression in a form quite different from anything which could be attempted here. For example, education has its physical aspects and those which are traditionally called practical; a fit and limber body, hands which can achieve the possibilities that eyes perceive, and thinking which comes out in bodily movement or touch as well as in the abstractions-the importance of all these is beginning to be understood in practice, as well as in theory. And as we form a clearer impression of the singleness of the indivisible personality, it becomes easier to recognise in practice that the physical and practical aspects even of an academic education are not supplementary to it but inherent; even the more abstract kinds of thinking would become thin and bleak without them. and the boy or girl needs all of them in concert. But a school's education must be considered also from other points of view: what conception of the arts does a school set before itself? How valuable is the school as a social community, and does it give its pupils a fair introduction to life as persons in society? Does it help boys and girls to realise, either while still at school or afterwards, any of the ultimate purposes of life in this world? Has it any spiritual quality to illuminate what is being done with a significance which carries its own conviction? Some of these questions are at any rate touched on in the course of these pages, but if little is said of many aspects of education which are of supreme importance, it is not because they have been out of mind. The chapters which follow aim at a more limited and modest objective, being concerned mainly with the intellectual development of the pupil and in particular with the ways in which the school curriculum can make its contribution to this development. Much thought will therefore have to be given to various questions of subject teaching, just because the curriculum bas in most schools to be worked out in terms of subjects. But all this is only a part of the whole story, and it should never be forgotten how much else there is which should underlie the intellectual aspect of school life. cannot really master because he still lacks the necessary experience and maturity of outlook; such a problem can arise in the teaching of literature, and it is not easy to strike a balance. In all such questions the teacher has to consider the development of the whole pupil, both intellectually and otherwise, so as to give him work for which he is really fitted. All this needs a nice understanding of the pupils, and a gift for exact timing; the best and most coherently planned curriculum is that which offers the best promise of fitting the work to the individual, without forgetting that the individual pupils have much to develop in common. Such a conception implies neither the inculcation of mere knowledge for its own sake, which sometimes characterises the older approach to education in its weaker moments, nor yet the notion of mere "self-expression" which has at times lifted up its head in more recent years, though without ever winning general acceptance. If high standards are to be reached, they must be reached through work which is really relevant to the boyar girl who is being educated. It has always been recognised in the humanistic tradition that education must be of the whole being, and therefore call never be expressed in purely intellectual terms. Bacon, for example, instead of writing "Reading produces a wen stocked mind" wrote much more truly and pungently" Reading produceth a full man". How can the full man be produced in today's education? If more boys and girls than ever before are to be educated at school until the age of 18, will they grow up into men and women who are lively and complete persons in their own right, yet aware of their duties in society? Are they likely to be perceptive? Will they be able to think clearly and honestly, and also to feel as well as think? Will they be able to act with decision and to stand up to the crowded conditions of work and life in today's world, without losing the quietness and strength of their own inner life at the centre? Never has the world had greater need of men and women capable of understanding themselves and others - men and women whose personality is harmoniously developed, whose culture is ever deepening, and who possess that quality of spirit through which they are strengthened, rather than defeated, by the experiences of life. In order to attain this balance or harmony, the school must endeavour to give to its children some measure of 'the vision of greatness' - the enlarging of experience, the inspiration which comes from daily contact with the good and beautiful, and the satisfaction which is derived from the utmost use of intellectual powers. work out his own curriculum. The freedom from administrative interference which the curriculum of the English school has retained has been unique in Europe during the last half-century. It is not for the Ministry of Education to dictate curricula, though the Ministry cannot help being deeply concerned in problems which affect so closely the whole system of national education. The suggestions which follow are put forward as suggestions, and indeed, if too many question marks were not likely to irritate most readers, they might be put forward in the form of questions. Much thought has already been given to the problems involved, both by individual teachers and by groups of teachers all over the country. Some of H.M. Inspectors have taken part in group discussions with teachers, and the chapters which follow have been prompted by these discussions. In this and subsequent chapters it will be suggested that the normal grammar school curriculum should be reconsidered in the light of the need to encourage boys and girls to stay at school until 18. For if boys and girls are to stay at school for so long, they must be able to undertake a course of work which will lead to the age of 18, not merely for reasons of policy but because the curriculum must follow the chi1d. This implies neither licence nor vagueness of purpose, but only that every curriculum should be judged in terms of its effect upon the pupils for whom it exists. Such a criterion includes the acquisition of knowledge and techniques in various subjects, but the ultimate question must still be whether the pupils are making the best possible progress and whether any alterations in their curriculum would help to make their progress better still. The application in detail of such a criterion to the curricula of primary and secondary schools alike is a comparatively new and most welcome development, though this implies no disrespect for the work of teachers in earlier generations. Many of these knew and loved their children and they certainly knew how to teach, but too often their efforts were hampered by rigidities of the curriculum which followed from the arbitrary standards of subject-knowledge then in vogue; if the children did not all measure lip to a common yard-stick, it was unfortunate, but subject teaching could not be modified to meet the needs of the individual child. The school of today cannot afford to be complacent about such matters; its teachers will not be satisfied if they cannot feel that their work represents a sincere and considered effort to give each single pupil what he needs most. merely at his progress of the moment, remembering that the part of his life which he lives at their school is itself only one chapter in his story, however absorbing while it lasts. As for the actual process of growing, it seems often, as Whitehead suggested, to go by fits and starts, and in any case there will also be moments of transition when he changes school or moves from one stage to another within the same school. Yet still there should be no violent breaks under the surface variations of daily life, but rather an even line of development. There is much ground to cover, and no time for avoidable distraction or interruption. The schools have to plan their work in terms of what their pupils should learn and become over the course as a whole, and if there is a reasonable chance of a boyar girl staying on at school until 18 this should be kept in mind from the beginning; otherwise the course is not likely to be really continuous. Naturally the conception of a continuous course does not imply that between the ages of five and 18, or between 11 and 18, everything at every stage should be regarded by the pupil and his teacher as a self-conscious act of preparation for whatever he is likely to do when he comes to leave school. The best preparation for the future comes out of work which though carefully planned is nevertheless spontaneous and absorbing in itself; spontaneity need not suffer if the work leads unobtrusively in the right direction, particularly in the forming of habits. Is it always realised, for example, how much the way in which a boy learns to write at perhaps eight or nine may affect his writing later on, or how much the way in which he learns punctuation at perhaps 12 may influence his work when he is 14 or 15, or the degree to which in the early stages of Latin or French a thoughtful teacher can help to prepare the ground for a much freer approach to reading and translation later on? Or, to take yet another example of a slightly different kind (which will be considered again in a later chapter), it is often found in practice that the child in a good infants' school can work for himself, and so can the sixth-former who is probably ten years older, but the implications which connect the two are not always applied to the intervening stages. for the general certificate of education promises (as it should) to give more opportunity than its predecessors for the development of continuous courses of study. Schools should obviously be free to bring on courses as and when the pupil needs them, and they need to be free to treat his career as a single developing whole; no magic break occurs at 15 or 16 which would justify a complete alteration in his studies at that point. The general certificate of education is important precisely because it gives the schools a much better opportunity than before of unifying the school course as a whole. it to be a barrier preventing growth. Teachers are more confident of themselves; they have been increasingly associated with the work of examinations and can no longer be said to be inexperienced. In our view the time has passed when such guidance and direction of their work as teachers need can best be given by means of an external examination. Whatever the justification, the effect of so much emphasis upon class examination has been serious. For an examination conceived in terms of whole classes means that the actual instruction which leads to the examination will also be worked out in terms of the teaching of whole classes; otherwise the examination is less likely to be passed. There has been little chance of much individual or group work developing in forms below the sixth, particularly in the fourth and fifth forms which should be preparing pupils for a natural transition to sixth form work later on. Individual work has been much more easily encouraged in the sixth form, but that there has been too little to lead up to it could be illustrated by many examples. Thus it is still not uncommon to find pupils wrestling with sixth form work in Latin who in the fifth form have done little more than learn the kind of Latin that seems to lend itself to mass-instruction, construing all together a little Caesar and mastering the curious knack of translating somewhat disjointed sentences into Latin; when they come into the sixth form, they find it anything but easy to master the very much more difficult work which they are likely to meet there, with its emphasis upon connected reading and translation implying much more individual forms of study. So in history, a pupil who has formed the habit of extracting the history of a period from an efficient but over-compressed textbook designed to be read by the whole class for a term (supplemented, perhaps, by standardised notes either copied or taken down from dictation) may well find himself bewildered by sixth form work in which he may have to read and judge between several differing accounts of the same event. It is hardly surprising that the first year in the sixth is a period in which many pupils seem to be marking time instead of pushing on into exciting developments of work for which they are ready. Too many pupils at this time lose ground which they never recover. The atmosphere of the sixth form is generous and full of encouragement for the individual, deriving as it does from the universities and an ancient tradition of liberal education. But freedom needs to be nourished and the influence of the coming sixth form should be felt in the forms below. A much closer relation between the sixth form and the forms leading up to it is assumed in the proposals for the new .general certificate of education. The new examination has yet to prove itself, and no more than any other examination can it offer a path to automatic success. But it does offer certain possibilities which are not always fully realised. The certificate is to be awarded as a result of passing in whatever subjects the pupil may care to offer, whether one or many. A pass may be obtained at one of *two main levels: Ordinary, corresponding in standard with a credit in the school certificate examination, and Advanced, which corresponds with the higher school certificate examination at Principal level. Pupils who take their main subjects at Advanced level (towards the end of their school career) will not need to take them beforehand at Ordinary level, and they will be able to concentrate from the beginning upon a steady and unbroken progress to their ultimate objective in these subjects. It is hoped that subjects will be taken at Ordinary level only by candidates who have reached a reasonable competence in them and wish to establish credentials in them at that and no higher level, whether or not they may be taking other subjects at Advanced level either at the same time or at any other time. *There are also papers set at Scholarship level. coherent school course. A restriction upon the age at which the examination may be taken will undoubtedly involve many schools in problems of organisation. But real freedom for the pupil is bound up with a more personal approach to his work, and such an approach should be easier, now that boys and girls of 14 and 15, however able, do not have to concentrate their energies on passing a standardised test of attainment. In practice, of course, any freedom of choice must inevitably be limited by many immediate considerations of staffing, premises and other conditions inside a given school. Many pupils, too, will still have to achieve passes in a certain group of subjects, if they wish to be admitted to the university Of professional body of their choice. Such bodies have their own points of view, which may justifiably differ from those of the schools; it should. of course, also be realised that the greater the number of passes demanded, the more difficult it will be for the schools to develop the continuous courses which are so much needed. Even so, the schools are likely to be more free than before, since the number of subjects required may often be less than the number of subjects normally offered for external examination in the past, and in any case the necessary qualifications can be collected over a period of time, so as to suit the pupil's convenience, and subjects need not be taken at two levels. It is certainly one of the avowed aims of the new examination system that courses of education should be worked out solely in the interests of the pupils. This means that they must follow the line of a pupil's natural development, being planned in terms of his whole school life. It is now possible for a pupil to postpone examination in his main subjects until the end of his career, and this is an opportunity inherent in the new examination system which ought not to be missed. Admittedly the new system can be used by schools very much as though they were still working for the old examinations under another name; if pupils are expected to pass in the same subject first at Ordinary and later at Advanced level, the courses are likely to remain separate and the pupil will ultimately be at a disadvantage as compared with someone who has gone straight to the Advanced level. It may be categorically stated that no school using the new system in the old way can claim to have accepted the challenge and the opportunities offered to it to base its plans on the interests of its pupils. At this point many schools will be aware of acute practical difficulties. They may feel that a continuous course is all very well for the pupil who is likely from the beginning to stay until the age of eighteen. But what of the early leavers and those who cannot make up their minds? It may be felt that if education exists for the pupil, this must apply whether the pupil leaves at 18 or at 16. This is true, and everything possible should be done for those who are going to leave early. But, as was stressed in the first chapter, it simply is not possible for an academic education to reach any great measure of completeness by the age of 16, and to pretend otherwise would be doing no service to the many who do leave at that age. They are likely to get far more profit from travelling for some distance along an exacting but generous course of work which points at the future, than from a course which provides the illusion of a completed education. If, of course, boys who are likely to leave early can take and wish to take some subjects in the examination at the age of 16, they should be encouraged to do so in their stride. The examination itself will often point to further possibilities of advanced study after they have left school, and of course every pupil who leaves should be encouraged to continue his studies, even though the last lap of the course may have to be taken in part-time study. The school course is only part of something larger and longer and if his school course can encourage the boy to look into the future, he will be much more likely to keep up his work, particularly if it bears a reasonable relation to what he was doing before. good, than if he feels that he has had a complete but inferior course. Then there are the undecided ones. It is to be hoped that as time goes on more and more will choose to take the full course, in spite of their parents' very natural anxieties and the often lucrative temptations to leave early. They will certainly be more likely to stay if the school's work is organised on the assumption that the full course goes on until 18 unless the pupil contracts out beforehand. *i.e. in 1950, the last year of the school certificate and higher school certificate Examinations. Finally there are those who do stay at school until 18. The immediate problems which arise when a school is trying with limited resources to do justice to all its pupils, whenever they leave, are bound to be very great. But it is possible, even so, to exaggerate the ultimate conflict of interest between those who leave early and those who stay on until 18. Most of the suggestions which will be made in subsequent chapters should apply to both kinds of pupil, and particularly those suggestions which imply that many in the middle stages of their secondary education are capable of doing more for themselves than has sometimes been thought possible. If there should be any conflict between the interests of the early leavers and those who stay on, then schools which are trying to meet the national need for fully trained men and women need not feel too apologetic if they put first those who are likely to stay the whole school course. The grammar school need have no fear to-day about organising its work on the basis of a continuous course lasting until 18, although as recently as twenty years ago such a step would have been unthinkable in most schools. If this is accepted, the advantages of the new examination should speak for themselves, whatever the immediate practical difficulties. It should in the future be a little easier to create a framework for a school's courses which will correspond in the main with the natural sequence of a pupil's growth. Everyone who has ever taught children must sometimes have asked himself whether he was really doing anything at all to help them. The more children come to be understood in all the originality and complexity of their minds and personalities, the more hesitation a sensitive person must feel about interposing himself between the pupil and the pupil's work. As more comes to be discovered about the ways in which, both at the grammar school and elsewhere, children slowly grow up and learn their own lessons in the process, what will there be left for the teacher to do? Certainly he can make the 'climate' propitious for study, and he can help in the planning of the work. But can he hope to do more than that, or is teaching something that may gradually become modified out of recognition, so that the teacher himself is in danger of becoming gradually superfluous, a still welcome but slightly obsolescent middleman in the process of education? Beateth his wings, and farewell he is gone. This kind of teaching is on its way out; even in its more disguised aspects there is very little instruction left that depends for its sanction upon superior adult power rather than anything else. It is disappearing not only because it is wrong - and, in fact, is not really teaching at all - but because newer conceptions of a teacher's work have taken its place. No teacher in a modern infants' school can have any sense of doubt as to whether she is really needed; the work in such a school is explicitly centred upon the child, and yet the children do not look any the less to their teacher as a guide to pilot them through it. Just as at home children need the security and wisdom of parents if they are to find their own feet, so at school; they will not grow up independent and strong without a sense of security to begin with, and this is as true for the intellectual aspects of education as any other. In the infants' school, in the sixth form, and in later stages still, the capacity for independent work remains inseparably linked up with close contact between the taught and the teacher. Certainly the grammar school teacher can be quite sure that his abilities and gifts will be fully exercised. It is true that direct teaching, however effective, can hope to go only so far; only the child can take in and absorb and be nourished, but "the homely slighted shepherd's trade" of the teacher should not be less exacting or rewarding because he cannot do such things for the child. It is the teacher's business to estimate what a pupil can or cannot assimilate, whether the fare win awaken appetite and satisfy what it has awakened. Can the pupil really hope to take to himself what he is learning? The teacher may never have the last word in such matters, but his help is not less important for that and his example may inspire his pupil to take in far more than would have been possible without him. experience by mastering something which was originally outside it. Here the pupil needs the help of teachers whose experience is wider than his; whereas the word 'education' applies only to people, the word 'teaching' has always been concerned with the thing taught as well as the person. What is learned by the child with the help of teaching he must bring within his grasp from outside. But the process of grasping can never be easy, and advanced work is particularly demanding; thus in the teaching of languages words are difficult to control and handle; mathematics in its higher stages seems a long way removed from what one would expect in any immediately child-centred curriculum. The boy who aims at advanced work must be prepared to wrestle with very recalcitrant material, whatever his ability or ambition; whether in languages, mathematics or the arts he will soon recognise that the subject-matter does not exist for the pupil's convenience. Though the subjects exist ultimately to be studied and mastered, they seem to follow laws of their own which hold good whether there are students about or not; mastery of a subject can only come through willing subjection to the very real discipline which seems to attach to it, as anyone will know who has studied a foreign language seriously. Any one community is apt to think that what its children study at a given moment is inherent in the scheme of things, and the artificial nature of any curriculum is overlooked. Yet the curriculum which is considered suitable for able boys and girls in an English sixth form differs widely from that which culminates in the German Abitur examination; this again differs greatly from what is normal in a French Lycee or an American High School. Even within a single country there is rapid change over a comparatively short period; the work in the English school of 1950 is very different from that of the school of 1900. As for 1650, both the average schoolmaster of the time and Milton, the would-be reformer, would alike have stared and gasped at the prospect of what is studied-and what is not studied-in an English school today; and conversely Milton's own Tractate on Education fills us with admiring horror. We can be certain only that the curriculum which we take for granted today will go on changing. . There is of course nothing to fear in the prospect of change, provided that for our generation, as for Milton, the subjects are clearly seen from the point of view of their effect on the pupil. The subjects found in a school time-table are there for a whole complex of reasons, in which the current values, economic and otherwise, of society play at least as important a part as the natural development of the child. Undirected self-development would be as tedious to the child as to those round him; he seems to accept readily enough that he is expected to develop himself within a predetermined framework, which will affect the subjects he chooses and the way in which he will work at them. The most obvious reason for choosing a subject is of course vocational. Mathematics, for example, must be a pre-requisite of engineering studies. But is a particular pupil studying mathematics for this reason, or as a form of mental gymnastic, or for reasons of general culture, or as a part of what is currently regarded as necessary equipment in a world which depends on precise and appropriate measurement? His ultimate reasons are probably mixed and by no means thought out, but they are not the less real for that. Such facile generalisations as that a boy learns Latin for the sake of mental discipline or history to discover the past or science to fit himself for the modern world need not be taken too seriously, but they help to point to the underlying complex of reasons in which tradition, current social values, economic pressure, and psychological and other beliefs are all to be found. sense of scholarship and much else has come only by effort and application. For some the full severity of intellectual training may come late, perhaps later than at school. If schooling could be continued for everyone until well over the age of 20, we could afford to travel rather more slowly and take a little longer; this would be in line with tendencies already apparent in the education of very young children. But the grammar school tradition has been built up by the hard work of boys and girls who discovered the demands and possibilities of advanced study while they were still comparatively young; probably in this way the best opportunities have been given to the greatest number, and many gifted pupils have begun to realise their own capacities in the discipline of serious study at school. Such an education can be at once child-centred and something more. Even "babies do not want to hear about babies ", and a wholly child-centred education could not satisfy even the infants' school. On the other hand, at the advanced as well as at any other stages of education the teacher must never lose sight of his pupil's mind and reactions, and the ablest boys cannot afford any more than the others to do without his help. No child, however brilliant, can balance this subject against that or consider the claims of the various aspects of education as a whole; such questions necessarily lie beyond his limited experience. Yet balance there must be and it must come from the teacher. But the teacher's work goes beyond either giving instruction in various subjects or plotting a reasonably complete programme of education. Far more important is what can be achieved in and through such every-day work, the direct contact between younger and older personalities. This is essentially a two-way process in which both parties have much to give and take; the process must never be regarded in any kind of work as one in which only the teacher is giving out. It is true that he has much more experience, and his pupils will accept and appreciate this if they are conscious of having access through their work to his mind. It is indeed this direct contact between mind and mind, achievable only where there is respect on both sides, which can both re-assure children and give them the most vivid possible insight into what learning can really mean. That a master should be brilliant is not always necessary; perhaps the contact between teacher and pupil comes out of modesty and understanding rather than from expert technique, however useful this. Which chooses to be reared upon their trunks. Such eccentricity is rare today, but the born teacher's individual quality survives and deserves its full chance. Many people in looking back on their schools days will find that what stands out in the memory is not so much any particular thing taught or learnt as the personality and character of some master or mistress who by direct contact of intelligences made a lasting impression on his pupils. They remember what he was, what he stood for, and the joke which he repeated twice a term. Whether he taught them much or little in the way of actual information and skill, and whether it was in the syllabus or not, the very fact of having been in old so and so's form had a profound effect upon the character and make-up of those who sat under him. And sometimes there were moments when he forgot to teach at all, as he went off on a train of thought, almost unconscious (to all seeming) of his pupils in his excitement, and they sat up and listened spellbound. Such moments may never be common, but many men and women know what it means to have experienced them. Children never forget the men and women who have taught them with understanding, and sometimes with insight. crowded curriculum. The ultimate test of any new examination system, and of the suggestions made in these chapters, must be whether or not good teaching can be given better scope as a result. No administrative improvements in the curriculum will be of much value in themselves, if the teachers do not find them helpful. Nor will skilful planning, effective administration and a good curriculum be of much assistance to the pupil if teaching as a profession does not continue to attract men and women who combine wide sympathies with deep and exact knowledge and the power of sharing it. This knowledge will always be needed in the grammar school, along with all that such teachers have in common with other men and women round them. In the course of this review certain questions of subject teaching have by now been raised directly or by implication. At all stages of grammar school education the teaching of subjects must play a prominent part, but there are many signs that subject teaching is claiming a position of even more importance than it can justify in a good general education. The grammar school tradition is partly new and partly old; how much of it has been formed in the present century is not always recognised. Between 1902 and 1939 secondary education was being developed in this country with great speed and an immense advance was made in the field of specialist teaching. More subjects were being taught and their content of knowledge in most of the individual subjects was increasing, both at school and in the university. It was rightly considered essential to establish high standards of subject knowledge, and the Honours Schools of universities grew rapidly, while potential teachers were given every possible encouragement to take these schools. Those who achieved Honours usually expected to become scientists or geographers or linguists, identifying themselves with the subject of their choice and expecting to teach this subject rather than anything else. Such specialist teaching made a most valuable contribution to secondary education at a time when it was needed, bringing with it an exact sense of standards and asserting the importance of giving to each subject its proper discipline and technique. claims are asserted for the various subjects which the pupil is learning; this subject is said to require so many periods a week (a claim often carrying with it a concealed and not necessarily acceptable condition such as that so many periods are needed if every pupil is to reach a given standard in the subject by a given time), or a subject is thought likely to lose prestige if not carried on till the end of the fifth year. Then it is still possible to bear the comment being made in all good faith that a particular subject should be offered for examination, because otherwise it would not then be taken seriously by the pupils. It may quite well be true that some pupils will not take seriously a subject which does not help them for examination purposes; even so the remedy is not likely to be found in increasing the number of subjects offered for examination. For in such a case something is surely wrong in the attitude of the pupils to their work as a whole, and until this can be tackled nothing else is going to help very much. Though the number of subjects is not everything, it may even be helpful to reduce rather than increase the number of subjects offered for examination (as will be likely anyhow under the new examination arrangements) so that boys and girls do not have to feel that all their serious work is always examined, and that what is not examined does not matter. assign the main responsibility for this state of affairs where it exists to individual teachers or institutions; in any case many teachers are achieving miracles of effective and sympathetic teaching under difficult conditions. But they would be able to do even better if the conditions (including the general climate of public opinion outside as well as inside organised education) were more favourable to a less specialised approach. An imaginary but not unlikely example of what can happen may be drawn from the teaching of English. It is not difficult to imagine a school in which English is regarded as being almost wholly the province of the specialist English master. He feels it his duty to concentrate in the limited number of periods available on the mastering of certain techniques, particularly in writing, and the collection of certain information about books, writers and language generally. His colleagues, who are all pressed for time in their own subjects, have not time for more than a quick glance at the English which may crop up in the course of their specialist teaching. Thus the English master is left to work almost singlehanded at a task in which single-handed effort can never hope to succeed. For language enters into almost every aspect of a pupil's work, and is often most effectively taught when the pupil has not been consciously thinking of how to handle words; it is in mathematics, history or science (where no question arises of the cultivation of words for their own sakes) that he is likely to gain the best practice of all in relating language with subject matter, whether in speaking, reading or writing. This is where he can best learn to make clear and useful notes, the nature of which follows from the subject; he cannot be expected to make an automatic transfer to science of all that he learned in English about making summaries, though English must always be expected to help. But if the English has to be left entirely to the English master, he will not have time for all that should be done. In any case the techniques cannot be effectively treated by themselves with no regard for the subject matter and without any time to spare for the emotional or imaginative aspects of language; even if in this imaginary school certain periods are reserved for what might have been the saving grace of literature, they will still tend to be spent on the acquisition of facts or the cultivation of style in the hope of improving the pupil's own writing. Language teaching is bound to starve on so restricted a diet; it can flourish only if it is regarded as something which goes through the whole of a boy's work and life, in all his speaking and reading, thinking and feeling, both at school and elsewhere. The English lesson should be the climax of something stretching far beyond it; if it fails, the result will react upon English and the other subjects. The example just given may serve to illustrate the complexity of the whole question, since to speak of lack of time is clearly not a complete answer in itself. Why was time lacking? Lack of time can be as much the symptom as the cause of over specialised teaching, and even if the number of hours allotted to English, Latin and French could be substantially increased overnight, it does not follow that an immediate improvement ill these subjects would be the result. For the specialist might feel it his duty to use the extra time in taking the more specialised aspects of the work a little further; one's own subject never really has time enough; there is always a temptation to feel that the beginning of real education can be deferred until "the ground has been covered ", though ground that is covered in this way will be a desert and education a mirage. Habits of teaching are but slowly formed and slowly altered; it may be not so much in the time allotted to a particular subject as in the teaching of it that one should look for improvement. Even with existing time allowances which are often inadequate, a more lively and selective approach might do much to raise the standard of a pupil's work. power is lacking, the main outline will be lost beneath superfluous detail; if the interpretation is false to the subject, what emerges will be a picture with nothing real behind it. Of course interpretation and selection are shown both in choice of material and in treatment of what is chosen, the two being distinct in theory but indivisible in practice. There is here a close analogy between education and art-or rather education is an art, and both the master and his pupil are in their own ways artists. The need for selection is recognised in practice by everyone, including the pupils. It is implied every time that the remark is made, "There is only time for teaching the essentials". Particularly in the earlier stages of subject teaching, there has been in recent years a welcome simplification of the content of education; something of the kind can be seen in many arts, notably in the simplified "functionalism" of so much modern architecture. If concentration on the essentials means the omission of such curious ornaments as the genitive case of "supellex" in the early stages of Latin or the plural of "vitrail" in elementary French, that is admirable; if it means laying stress on the acquiring of a good knowledge of grammar and vocabulary in learning a language, or on a knowledge of the essential facts in history or geography, or on the capacity to perform certain operations in mathematics, no serious critic would object, since all these things are at the centre of the respective subjects and the pupil will never get far without them. ut pueris place as et declamatio fias. that will let you satisfy the school boys and become a set piece. In the examples just given it seems to be the values of imagination and feeling which are so often neglected as being somehow non-essential. Such intangibles as the artistic side of language and particularly poetry, the imaginative approach to history or geography, or the points at which one subject meets another are seldom easy to weigh, measure-or examine; their communication is difficult, too, and needs a mixture of sympathetic teaching and freedom for the pupil to choose for himself. Yet they are none the less necessary, particularly though not only for advanced work. The geographer will need a sense of all that his subject can do to link the liberal arts with the sciences; he cannot, for example, understand Persia or India or China without some feeling for the ways in which Eastern civilisation differs from our own, and this will involve history, art and language. Eighteenth-century history in England cannot be really understood if the forms of its civilisation are not appreciated as well as learned; the meaning of such words as 'reason', 'enthusiasm' or 'sensibility' will never be grasped by merely looking up the dictionary. Even in science and mathematics the intangibles are important. Apart from the very real aesthetic value of these subjects, one could hardly study the calculus or heredity or grasp any but the most elementary forms of scientific process without a good deal of imaginative perception of what is not to be perceived in any other way; the history of either subject will bear this out. the pre-occupation of our own times with the material progress of economic man to the exclusion of other forms of progress. What is dangerous is not the interest in material progress as such but the exclusiveness of that interest. It can be felt in the reactions of boys and girls at school, who are eager to learn but inclined to dismiss as irrelevant those aspects of their work which do not add to their store of facts. There are signs, however, of an increasing realisation that our civilisation and our education alike have taken too much for granted these aspects of the good life without which material progress would have no purpose. Much current thought in education is directly concerned with what a recent book calls "the spiritual development of the individual, using the word spiritual to include the satisfaction of the highest intellectual, moral and aesthetic qualities". Such questions lie beyond the scope of these chapters, but they are raised because changes in either the machinery or the aims of education cannot be considered in isolation from the wider background of the civilisation into which pupils are being educated. However desirable in themselves, such improvements as a more evenly developed curriculum or a less specialised approach to subject teaching will never be enough in themselves to solve the problem of competing specialist subjects within an overcrowded curriculum without the help of many forces outside what is usually called education. But education proper still has its obligations to meet in however modest a mood, and in the next chapter the curriculum will have to be considered in some detail from the point of view of the contribution made by the subjects to the pupil's general education. It is in the experience of the children whom he teaches that the expert will realise the full possibilities of his own subject. It should by now be possible to form a fairly clear picture of what a general education means in practice. Now as in the past it can be considered only in terms of the whole growth of each individual pupil, measuring this in terms of quantity and quality so far as either can be estimated; the intellectual aspects of education must in the long run be judged by their contribution to this growth. close relationship between subject and subject, are coming to be more and more clearly recognised. This too in time may be pleasant to remember. values and to assess himself and others. The contribution to this process of the single subject is essential, but it still remains the contribution of the part; something more is needed by teacher and pupil alike, as both grapple with a problem, mastering its facts and assessing it in terms of relation or motive or intention. and from a moral, emotional or aesthetic angle as well as from the vantage point of intellect. There is nothing cold or bloodless about the process; it seems to involve partly intuition and partly the ability to use capacities developed through training. Once the pupil begins to see (like Aristotle's poet) that things apparently separate are really linked up with each other, his. education will begin to develop a coherence and purpose which it never had before; in such an education it is impossible to conceive any internal conflict of subjects. effective, it will then be time to consider the subsidiaries. The whole question of the relation between main and extra subjects needs more attention than it has received in recent years. But subjects also have their own unique contributions to make, and from this point of view it matters very much what subjects are taken by a boy and how many. The content of French differs from that of Latin, though French derives from Latin; each has its own specific importance. The subject-matter of mathematics is different from any kind of language, and possesses an immediate value which speaks for itself. Just because different studies are likely to impress and shape different students in such very different ways, it matters very much that a boy who is likely to specialise in classics or mathematics should have the temperament and kind of ability which give a prospect of justifying the choice. Vocational reasons by themselves are not enough. It is important too that equal care be given to the choice of subsidiary subjects, whether they are designed to complete his elementary knowledge in other fields of experience, to link up or contrast with his specialised work, to add experience for his imagination to work on, or to bring out his social responsibility. fifth form should be given to non-specialist subjects, and between a quarter and a third in the sixth. All this will affect both the pupil's choice of subjects and the time available for anyone of them. The individual subjects should gain greatly in the middle of the school course. But quite apart from any question of its own natural balance. the curriculum as a whole would gain greatly if in their entrances, their parts on the stage and their exits the individual subjects could be treated altogether more flexibly in the light of their own nature and the pupil's needs. Certainly in a gradually tapering curriculum it would be easier to introduce certain subjects at the point most suitable to their nature. If, for example, Latin is not begun until the sixth form by those pupils who for some good reason did not begin it earlier, the course will probably be too short for any of the things which can make the study of Latin by a mature pupil so rewarding. Where an early beginning cannot be managed it should now be possible to begin Latin in the fourth or fifth years instead of waiting until the sixth. work if it were regarded as the final part of a seven year course in which the fourth and fifth years were spent in the work that would most effectively prepare them for the sixth and seventh years; this means that by the end of the fifth year they should be in a position to draw upon an appreciable experience of speaking, reading and writing in French. Even those who for any reason might have to break off their French Course at the end of five years would be in a better position for resuming the threads later on - if opportunity should occur - than if they had to work for a premature climax which hardly seems to correspond with any corresponding climax in linguistic mastery. The history pupil, too, should follow a course which, whether continuous or at times interrupted, leads steadily in the direction of real history; he should come comparatively early to the reading of more than one book about the same event, and written and spoken work could lead unobtrusively from the beginning towards the independent comment and assessment that he will need in the sixth form. Even if by then he may no longer be reading history, he will still need all his powers of independent comment and assessment for work in other subjects and for later life. are of less moment to them; for example, modern linguists might well maintain a reading knowledge of Latin, students of classics a knowledge of French, and both might add the elements of a new language at the sixth form stage, as for instance German, Russian, Spanish or Italian. Lower down the school French may be treated in one way as a study for pupils of linguistic ability, but in a very different way for pupils whose main purpose is to acquire a little familiarity with French life. The same principle is particularly important for the planning of courses of science. It is desirable that a boy of literary or linguistic gifts should study science at one or more points of his career, perhaps at a relatively advanced stage as well as earlier. But clearly the syllabus must not make the same demands upon him or his time .as upon his friend whose main interest is science. In such subjects as history and geography both the selection of material and its treatment offer infinite scope for variety. Nevertheless no alternative ways of dealing with a given subject are likely to make it profitable to pupils whose sheer inability has come out in the earlier stages of teaching; such pupils ought to be allowed to drop the subject altogether, devoting the time so saved to a more profitable occupation. In any case some subjects will have been dropped comparatively early, once it becomes clear in which directions a pupil is likely to develop. Thus in elementary Latin it should be possible to judge within two years or so whether certain pupils would do better to abandon the subject at that point; equally important, it should be possible within the time to give them an introduction to Latin which they will remember with interest whatever else they may study later on. There is no reason why mathematics should not be dropped by some pupils as early as the end of the third year, and here as in Latin the syllabus should take account of the subject's natural halting places. Each subject seems to have its own natural sequences or stages, which follow from its own internal structure. Certain subjects even seem to admit of being dropped at an appropriate point in order to be resumed later on, perhaps in a rather different form. take languages, in which vocabulary and grammar, translation and retranslation, reading and speech all follow each other in an intricate repetitive pattern which slowly builds up as it goes, bringing in new elements all the time; so in mathematics each successive rule or theorem follows with the directest possible consequence from everything which has gone before. Any interruption in the study of such subjects would do harm. But a continuous course in geography or history or (for many pupils) in science does not seem so essential. It is not necessary in history to follow an unbroken course which builds up from the beginning of recorded time to the present day, as would be necessary if history were a branch of mathematics; even the sense of chronology which is so much needed would be better got in other ways. Such a subject can be divided into topics or periods, each of which is coherent in itself and capable of being related with others; even within a period (such as that between 1603 and 1815) development depends not on the successive understanding of steps in a logical process but on the growth of a pupil's historical understanding as a whole. It should often be possible to come back to the same period more than once, finding more in it each time and perhaps considering quite different aspects as a boy becomes ready for them. The Norman Conquest, the Civil Wars of the 17th Century and the French Revolution need one treatment for most pupils of 14, but a very different treatment for most pupils of 17.
ously treated while they are being taught, with a careful selection of the right subject-matter and an eye for the point at which one subject meets another, there should be nothing but gain if they are sometimes rested at suitable points. An intermittent course of three or four weekly periods may be much more valuable than a nominally continuous course of only one or two periods a week, without needing any more time in the long run; in this way too it might be possible to continue at certain points in the sixth form the study of several subjects which would otherwise have had to be dropped much sooner. If, of course, it should be possible as the result of such an arrangement to effect some economy in the total time allocation to a particular subject over a period of years, that is all to the good, though such economy will not always be possible. The planning of such courses should be full of possibilities, particularly if the master knows how to vary treatment of his theme. For example, a two or three years' course in art may be tedious to many boys, and yet at some later stage their interest can be awakened perhaps by the architecture disclosed to them in their history studies. If a shorter course, involving an altogether different and more intensive treatment, can be provided in such a subject at a time when pupils return to it fresh but with a certain amount of general knowledge and experience, the result may be more valuable than a continuous course taken by everyone at once, irrespective of personal interests or rates of progress. geology. In this way too schools may develop work based on a centre of interest, which cuts across normal subject teaching and touches more subjects than one. It is fair to ask in considering the general balance of subjects within the curriculum whether the opportunities provided by school activities, clubs and societies are being sufficiently taken into account. Their contribution may certainly be sufficient to have its effect upon the framing of the curriculum, though they may well need a starting point in school periods; in this way, without requiring more than a comparatively brief total allocation of time in the school week, many activities which have a vital bearing on the scope of a pupil's education as a whole seem to take shape of their own accord as an overflow of interest and energy from the classroom itself. They are a particularly marked feature of boarding school education, but within the available time the day schools also have developed such activities very fully, and masters and mistresses are generous in the time which they devote to them. Here more than anywhere else life in school and the life beyond school have a chance of coming together. Many a pupil has discovered for himself in the process that there comes a point at which work and play, school teaching and self-development, subjects and personal interests all meet and mingle; such a discovery is of particular importance for later life, when school itself has passed into something else. Most of the preceding paragraphs presuppose a reduction in the load of subjects carried on by any single pupil below the sixth form, while even there they assume a much more flexible approach to certain parts of the load. It is therefore all the more important not only that the subjects chosen should be chosen well, but also that subjects omitted for the time being or permanently should still be in mind. Is it possible that many of the values of what is omitted may be realised through what is chosen? If for example a teacher of history realises that many of his pupils are not taking geography, will it not help both subjects if he does what he can to redress the balance? History, geography, and English are obviously near relations, being concerned with the exploration of man's adventures and experience in the past and present world; such studies have so many common values that though a pupil need not be pursuing courses in all these subjects at the same time, he need never lack work providing the kind of opportunities which these subjects give so freely. Sometimes a complete or at least a partial fusion of subjects. may be possible. Geography and history have often been taught as one subject, and the various branches of science have been combined into the new subject 'general science'. Perhaps success is most likely if one subject, as usually happens in general science, predominates in the partnership. It is true that, for various reasons, attempts at combination have not always been successful, perhaps because of failure to realise that when two subjects coalesce they form not the sum of the two but something new and distinct with a purpose of its own. The new subject must not be judged from exactly the same point of view as the old; if, for example, in the study of the United States of America an inspiring teacher can fuse history and geography into a genuine unity, the pupil may for the time being be less fluent in answering the kind of question about the U.S.A. which he might have dealt with in the traditional manner during the surrendered geography period. But he should have a better chance of discovering and remembering for himself something of the way in which the time and the place are always affecting each other in the story of American expansion; the Mississippi, the Mason-Dixon line, and New England as a whole cannot be said to belong to either history or geography; they represent both at once and much more still, and should gain from being studied accordingly. Even so, difficulties are likely to arise in the early stages of such an attempt at combined operations while everyone is self-conscious, the traditional disciplines associated with the old subjects have not yet given way to the new discipline, and even the teacher is probably inclined to lecture too much in the effort to make his purpose clear to his pupils-and himself. But as the first awkwardnesses wear off, the real possibilities of such an experiment should begin to appear. mind at once and a watchful eye for the points at which they meet in the classroom. But he should soon realise that what is peculiar to each is less than he supposed, and that new elements of understanding are coming out of the association which will make for an ultimate achievement much greater than he could have expected from either treated separately. Even where it seems better to allow a subject to retain its full identity, he will consider it in relation to its neighbours, particularly when t.he allocation of periods or the time-table comes to be reviewed. English, for example, is essential and part of the birthright of any English boy, but a pupil who is learning two or three foreign languages will not need either the same amount or the same kind of English as the pupil who is learning only one other language or perhaps none at all. This mayor may not imply an ultimate reduction in the total number of periods given to English throughout the school, but even if it does, that need not mean that English will suffer. For English, like every other subject, stands to gain from a close understanding with its neighbours, and the time is past when the importance of a subject can be measured in terms of the number of periods it can command. brilliant, in such subjects as English, religious instruction or history, and not merely in Latin or Greek. Such an arrangement means that he can illuminate one subject in terms of another, and all the subjects alike should gain from his deeper knowledge of individual boys. So long as he meets them often enough to hold them together in work of real significance, he is likely to be one of the most cohesive forces in a coherent curriculum. There will, in any case, always remain a wide and important field for the specialist teacher in every subject. He knows his subject in depth, his teaching should give the expert lead that is wanted, and it will often be his task as head of the department to co-ordinate in a unified course the work of colleagues with a less highly specialised knowledge of his particular subject. The form master's teaching, particularly in subjects not his own, will need to be adjusted and assimilated to the general programme of subject work worked out for the department. This is to the advantage of everyone concerned, and presupposes a good deal of informal contact and consultation. It is important, too, that such consultation should always include the house master or his equivalent, by whatever name he may be called, There are more points of view than one, and it may be easier to see a pupil's progress in the round if there is someone who can keep a careful and sympathetic eye upon his development in work, play, and the rest of his life at school. What matters most of all is that all the different contributions of individual teachers and tutors, whether form masters, specialists or house masters, should be given in concert and in full awareness of the boy's total intellectual and other needs. In such a climate of teaching the pupil will have a good chance of striking a happy balance for himself. in country districts where masters and mistresses have always had to meet a comparatively wide range of demands with limited resources. But it by no means follows that an increase in staff will be a necessary consequence of the changes considered here. For one thing, as will be suggested in a later chapter, there is probably too much class teaching and not enough individual study in most schools today; individuals and groups, if more individually taught, might be expected to do more work by and for themselves, and there should also be certain opportunities for linking up individuals and groups (including sets) in ways which have seldom been possible until now. It does not follow that there will necessarily be more teaching in the school of the future, even though the teaching which there is should be more effectively conceived in terms of the pupil. needed will be most difficult to achieve does not make them any the less worth setting down and seeking. In the profession of teaching there are tasks to be performed in the immediate future which should appeal, as in the past, to men and women of ability. The subjects in a pupil's education have now been considered, however briefly, from the point of view of the curriculum, the individual subject and the teacher. Much still remains to be done, if what is still a rather territorial conception of subject teaching is to be modified in the right way. The curriculum will still be made up of subjects, and would indeed be meaningless without the help of its constituent elements; it matters only that these should not be kept remote from each other or from education as a whole, behind high walls. As one regards the subjects from such a point of view, they may still continue to represent most effectively the different fields of learning and yet the boundaries between them wear curiously thin. The individual subject begins to appear not so much as territory defined by its edges, but as something which, however distinct and unique at its centre, can further out be described only in terms of various fields of force meeting and interacting with those of other subjects. Time is time at the centre of history, place is place in geography. But away from their centres the subjects meet and may even sometimes merge. Above them still is the general education which the teachers help their pupils to find for themselves; it is this education which the knowledge and disciplines of subject-learning exist to serve. It is time to ask how far and how quickly the suggestions made in previous chapters could be translated into actual school practice, assuming that they are desirable in themselves. Consider for example a single sixth form; this boy may be collecting a small group of examination passes at Ordinary level before leaving school while still under 17; that boy wishes to meet university requirements by taking two subjects at Advanced level and three at Ordinary level just before he is 18; a third may have reason for wishing to take as many subjects as possible at Ordinary level before he is 17, in order to clear the decks for more specialised work in his final year; a fourth boy may have to meet the special requirements of a particular profession; the fifth is a bright youngster of under 16 with plenty of time in hand; and the sixth is nearly ready for the university. Here is God's Plenty, but what can a school do about it with limited means, however legitimate so many diverse requirements may be in themselves? Only the head master of a particular school can answer such a question in the light of his school's individual resources and limitations. He may well wonder whether, by increasing the variety of choice in courses based upon individual needs, he will not be spreading limited resources even more thinly than at present. That many things which he would like can be introduced only very gradually was accepted at the end of the last chapter; nevertheless there may be some which need not wait long. that such terms as 'child centred curriculum', 'a freer choice of subjects' and 'a more flexible planning of subject-courses' must all stop well short of implying absolute freedom for the pupil to choose whatever he fancies. He will certainly wish to take account of a boy's reasonable wishes, and possibly some schools may wish to go further in this direction in the future than in the past. But no suggestion made in these chapters should be taken to imply that pupils who do not know where their real interests lie should be given a freedom amounting to unfettered option or mere caprice in assuming or relinquishing the study of a subject, nor can they be left free to drop a subject just because it is becoming difficult. The ultimate freedom of choice in any school curriculum must lie with the school; otherwise the pupil's own freedom would be worthless, because the school could not function effectively. It is important too to distinguish between variety of choice and the number of subjects chosen. As has already been suggested, boys and girls at certain points in their school lives, and particularly in the fourth and fifth years, should be given rather more choice between various subjects. But a wider range of options may and should mean that such pupils will be taking rather fewer subjects than before, as they gradually approach the threshold of sixth form work. The head master should find that the total pressure of subjects on the time-table can be appreciably eased. older, they become more gregarious, yet in junior as in infants' schools it is becoming more and more common to find boys and girls completely absorbed in their own individual work, whether it is reading or painting a picture or going over a story, while the teacher quietly goes round them in turn. It is common too in junior schools, and particularly in small village schools which cover a wide range of ages, to find small groups within the same class working steadily away at their own particular tasks. Some of these children go on to grammar schools. As the comparative stability of the period between 8 and 11 comes to an end with the gradual onset of adolescence, they may become less amenable to suggestions, yet they do not lose the power of working on their own. At any age much depends on the lead which is given and the kind of work which is expected from the pupil; the responsibility of boys of 13 in a good preparatory school or of boys and girls of 14 in many good modern schools should give some idea of what can be expected with children of these ages. 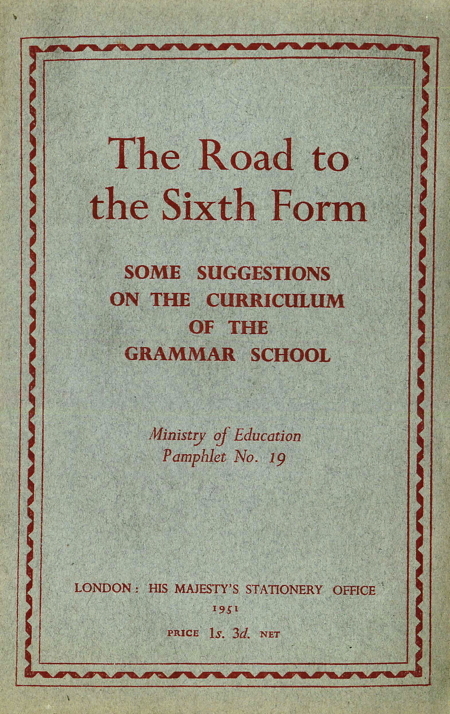 Though class work will always play an important part, and as a rule the main part, in grammar school instruction, there is no stage at which it ought to be unrelieved, and it is open to question whether the children in the lower forms of grammar schools are as completely gregarious as is often assumed in practice. It is true that the individual child is long-suffering and seems quite happy (if at times inattentive) as he moves from a lesson in algebra to a lesson in English to a lesson in physical education, which after a short break leads on to a lesson in science followed by a lesson in hi.story-and all this in a morning! Yet is this really the only possible pattern of instruction, or the best possible pattern? Whether he is likely to leave at 16 or stay on longer, he will still need to be able to work on his own in later life, and he should be given practice in studying both independently and in small groups. from group to group, or from individual to individual, helping (and often watching) as they go on at their own pace, and going over the result. Individual and group study alike will need very careful preparation and following up if they are to succeed. and the best results come when such forms of study are often associated with a definite and purposeful job, perhaps consisting of an assignment of work covering several time-table periods and leaving the pupil or pupils responsible for dividing out and using the time available. Such work is often even more exacting to manage than is teaching in class, but it can be very rewarding, and the school which encourages it will find that the periods of class-teaching are all the more valued. From quite an early stage boys and girls who are working on their own or in groups may well have periods when they are left free from the supervision of a master or mistress sitting in the same room. Not every school may regard this suggestion as easy to accept, but it is made not so much with a view to conserving teaching power - though this may be possible - as because boys and girls should be encouraged to work on their own anyhow. Admittedly, to decide how and when independent study can be prepared for and introduced may call for a good deal of perception and courage on the part of the head master and his staff. Much will depend on the possibilities and limitations of the school buildings and on the previous traditions which the school has built up. But it should always be regarded as one of the most important indications of good teaching and good learning that the pupils are able to go on working when they are by themselves as well as when the master is with them. Homework is worth considering from the same point of view, as an important extension of independent and group study as well as of the class lesson. It should be regarded as Clausewitz regarded war, as "a continuation of policy by other means", and planned in the closest relation with the rest of a pupil's work. If it is properly linked up with a well conceived programme of work at school (which will involve individual study there too). the pupil is likely to profit far more by it than if his work at home is always to consist automatically of preparation of the next piece of translation, the next batch of sums or the next chapter of history, to be tested next day, marked and then forgotten. Like other forms of private study homework provides one of the main opportunities and tests for good teaching, and more than any other form of study, particularly in day schools. it helps a boy to associate his work with the world outside school. As boys and girls grow older and more responsible, they should be ready for an extension of independent and group study, particularly in the fourth and fifth years. If, as has been suggested, fewer subjects are taken at this stage, there should be more time for such study; as the external examinations are neared, its value should be fully appreciated. Whereas under the old examination system a boy has taken, say, eight subjects all at one level and three subjects two years later at another level, he should now have to take an examination in only five or six subjects in all, and in each of these only at the moment and level which may be most appropriate to him. This means that in future such a boy should be more able to work at the varied pace or at the varied standard which may suit him in different subjects, sometimes with no examination in view. As was implied at the beginning of this chapter, such an individual pattern of education raises problems not easy to solve on the basis of almost continuous class-teaching in the middle or upper school. If every pupil or every group of pupils should have to be taught separately and continuously, the result would be chaotic-and there would not be the masters or mistresses to teach them in the first place. But boys and girls who are already well grounded in habits of responsible study should be able to prepare for the new examinations as the time approaches, quietly and without fuss; if for part of the time they can work on their own either individually or as a group, it should be more easy to meet the reasonable demands of a number of pupils with a limited staff. And such a balance of work should in itself help to bring out all that is best in a pupil's capacity. form in order to work at perhaps two subjects at Advanced level might join in with a fifth form group in subjects which they are not intending to take so far. Such interplay between the two forms should be of great value, always provided that at no stage is setting or any other arrangement of work carried so far as to destroy the "form". Too much time spent alone or with only a few others in the fifth or sixth forms would be as bad as too little, for half the pleasure of advanced work comes from measuring oneself against one's equals. It is important too that scientists, linguists and others should have opportunities for meeting on common ground. Sometimes such meeting places will be on ground not required for examination purposes, but in such subjects as English there may be quite large groups taking the subject for examination though in very different combinations with other subjects. The form should remain an essential meeting place at the centre. Flexibility of organisation is not in itself likely to overcome all the handicaps due to cramped premises or lack of staff, but even in small schools organisation should help to make what there is go a little further. Quite apart from this, it should be a most exacting but satisfying task to bring on individual pupils according to their capacities and rates of progress, so that when they enter the sixth form they are already in good training for the responsible work which will be expected of them there. And if a more individual approach to the planning of the time-table should lead before long to teaching which is more informal than it used to be, that does not imply any relaxation in standards of effort. With greater freedom it should be possible to concentrate even more single-heartedly on maintaining the most severe intellectual standards. For the grammar school, however flexible its curriculum, will still cherish a certain firmness in the treatment of its pupils' work, and there can be no compromise with anyone who suggests that high standards of learning and thinking are too much to expect. The purpose of the changes which have been considered is to make grammar school education more continuous, more individually conceived, more rewarding - but not less exacting. In the previous chapters the grammar school curriculum, the aims of its teachers, the subjects which they teach, and the ways in which pupils learn have been successively reviewed, in the conviction that the present time offers a real opportunity for bringing grammar school education even more closely into line with the natural development of children as they grow up. Inevitably many of the suggestions that have been made are tentative, and, as was suggested at the outset, many of them might well take the form of questions. At such a time the schools themselves must have the greatest say in the general discussion; if an academic education cannot from time to time attempt to re-express its intellectual and other ideals in the light of its own generation, it will end by sounding hollow and unconvincing. Whatever the administrative and other difficulties confronting it, the grammar school has no choice but to meet the challenge of our own times in its own way, just as other schools must meet it in theirs. learned should be regarded not as isolated parcels of information or technique, but rather as elements in the complete experience of the pupil as he grows up in his school environment. Can his teacher give him in his subject work and in everything else this sense, however unconsciously it may develop, of the essential links between learning and the other parts of living experience? Then his learning will not be tucked away in a separate cloakroom of the mind but he will be able to make it part of himself, and his growth will be even. From such a point of view it will be necessary to review, however incompletely, one or two of the other aspects of school life; they may at least indicate a field in which grammar schools should find scope for future development. For one cannot consider the equipment for life of most highly educated men and women without feeling that too little attention has been paid to the artistic, social and spiritual aspects of living. Without these there is bound to be a certain bleakness, which rightly or wrongly is often associated with the intellectual side of education. Yet what is wrong is not the intellect but its isolation, and the failure to do sufficient justice to some of the other possibilities with which boys and girls are endowed. It is not enough to plead the economic difficulties of our generation or to claim that, when physical resources, finance and time are all limited, we must concentrate, instead of attempting everything at once. On what should we concentrate, and can we claim to have reached a reasonable balance in the weighting of the different aspects of education at the present time? Many men and women who teach in schools and many outside schools have been asking themselves such questions; they cannot be ignored. enough attention in school hours, particularly after the age of about 15, and instead there has been a tendency to allow them such scraps of time as can be spared from what are thought to be more important occupations. In consequence many boys and girls have left school knowing or caring little about painting, which they may have abandoned quite early, or music, which possibly received one weekly period, or drama, which mainly consisted of a play got up for speech day. It has even been possible to reach Distinction standard in external examinations in English literature, Latin or French alike, without realising that much of what was being read for these examinations had significance as poetry. With distinguished exceptions, one could hardly claim that in grammar schools (or for that matter in any other kind of school at the present time) the arts are making the contribution to the whole education which might be looked for. or over-persuaded) to find out and take up for himself at least one art in which he can achieve something of the experience of creation. Such an experience will bring with it its own purposeful discipline; but if he is to have a chance of coming so far, he should first be given the means of entry into more arts than one, so that he can judge for himself what is likely to touch him most closely and also gather some idea of the arts as a whole. It may be possible, at any rate in the upper part of the school, to arrange for periods when the pupil may make his own choice from among several arts; such an arrangement should not be too difficult to plan in a flexible curriculum. But the arts should never be regarded as being confined to the limited number of periods available for art teaching proper; they should in many of their manifestations go right through the ordinary work of a school, so that pupils may grow up regarding art as a valuable and frequently recurring element in real life, rather than as something relegated to the drawing room shelf. Education is itself an art, requiring from teacher and pupil. as was suggested in an earlier chapter, an artist's feeling and selection and expression; the liberal arts represent a conception in which the ordinary subjects of the curriculum and the visual arts, music, movement and poetry can all meet. To this end two things are necessary; first that the teaching and learning should not be too abstract in any subject, and second that the moments of beauty and insight which every subject can offer should be waited and watched for. It has always been recognised that the power to abstract is one of the supreme aims of a good grammar school education; a pupil must learn to see through the momentary externals of circumstances to the principle beneath. But the moment of abstraction is a climax which cannot live by itself, as has always been known in the sixth form, where the scientist has plenty of experiment that will cultivate the mind through the senses, and the humanist can find much in his work to feed and warm his imagination. It is lower down in the school that the power of abstraction has sometimes been confused with an abstract, even arid mode of instruction; in a more spacious and unified curriculum there should be more opportunity for encouraging pupils to see and hear and feel their work from the very beginning so that they may think about it all the better. Good teaching will take every opportunity for giving width and warmth of experience to the intellectual education, and will see in every subject the moments when the reality appears behind the thinking, at a level which cannot be expressed in plain prose. Something has been said in an earlier chapter of the intangibles -they are often to be found with a little seeking and sometimes they stand out vividly when geography touches Chimborazo, Cotopaxi or the golden road to Samarkand; or when history touches the inspired achievement of the past, when the French lesson begins to feel the Alexandrine, German the irony of Goethe, or classics the rhythm and mood of Homer or Virgil. And so with the moments where such arts as architecture, painting and music enter into the subjects; languages or history or literature cannot be understood without their help. The material of art lies all around, and the artistic experience, which plays so great a part in the real process of coming to understand, is implicit in all the work which master and pupil share between them. The quality of the social education provided in most English schools probably offers fewer difficulties. The achievement of each individual school considered as a small society-or perhaps rather as society in miniature-is naturally variable, but the general level is high. There can be few grammar schools in which pupils do not learn a great deal about living as reasonably free but responsible individuals among their neighbours. They learn in many ways and in many subjects, as with the arts, both by precept and by the example of teachers and companions. Much they should learn for themselves, as prefects, as members of a games team, or by managing their own ,affairs either as individuals or as members of some club or committee. Here too they will have much to learn but it will be learned all the better if the process is not too self-conscious at any point. As the Ministry's recent pamphlet" Citizens Growing Up" made clear, social education is not merely a matter of current affairs or social studies (which have great possibilities, but are most effective when their limits too, are recognised); it comes first from living in a good society and learning to combine the responsibilities of being both an individual and what Aristotle calls a 'political animal'. Such a process also requires time and some leisure, if growth is to be even. runs a deeper stream. Much of it seems to belong to the unconscious though insistent needs of our nature, but the conscious mind is needed too. Do the boys and girls in a school have occasion to think and feel deeply, though according to their years, about the purpose of their education and existence, the ultimate aim of the life for which they arc preparing? Or can they ever pause to reflect on what they have to give to the world in which they find themselves? In a world in which good and evil are so conspicuous and so intermingled, education must help boys and girls to work out their own salvation, so that they are not left rudderless, and the result will be seen in the spiritual quality of what they do and become. Individual schools approach this part of their task in many different ways. The origin and tradition of English education is essentially religious, and this tradition, for those schools which cherish it, mayor may not be denominational. Many schools believe that by basing their work on religious foundations they can give their pupils something that can be got in no other way, and not a few can recall in the bidding prayer their founder, "by whose benefits we are brought up in godliness and good learning". But all schools alike appear at the present time to be deeply concerned with the good growth and wellbeing of their children, and to take account of the problems and purpose of living in the contemporary world into which the pupils are growing up. A great deal of hard thinking is going on about the whole purpose of education, though the full effect of this thinking has naturally still to be reflected in practice. That there is still a long way to go would be accepted by most grammar schools as. self-evident. misgiving; on the one hand possibilities of a future of infinite opportunity seem to be revealing themselves just ahead of us, and yet a false step may land us all in disaster or destruction. Education is in the same position, for better or worse, as our other activities. In such a context there is a limit to what schools can do; their most important task must be to give their pupils an initial sense of confidence and high standards in whatever they undertake. School life at its best is neither too absorbed within its own pattern of culture, however satisfying, nor yet too ready to break down all the boundaries between the' nursery slopes' and the mountains beyond. Pupils should be conscious of the outer world and their own responsibilities to it, but there is no need to encourage them to take on the business of being adults before their time; school needs all the time it can get. The task must have been easier when change was slower and schools were smaller, but it was the very success which the grammar school then achieved which proved largely responsible for the rapid increase in the number of its pupils, and, more important still, for the recent widening of the whole scope of secondary education. In such a development, which is still going on, the grammar school has much to do in helping to preserve the natural continuity between past and present and development still to come. To give an education of even higher and more individual quality to greater numbers than ever before is a most difficult task, but that is the measure of what has to be attempted. It should not be impossible, particularly if full use can be made of some of the encouraging developments which, as these pages have tried to show, seem to be coming into view already. The grammar schools have in recent years given plenty of evidence of their vitality; it should be within their capacity over a period of time to replace forms of organisation or teaching which may be becoming obsolete with something more individual in its approach to the pupils. The essential needs of boys and girls do not change. but from time to time the traditions of work which are forming all the time in school and in society should be looked at in the light of what we know about boys and girls and other human beings. Grammar school work has every reason to welcome such a review. Other forms of secondary education exist today or are planned for the future. The grammar school has had much to do with their origin, though they are rightly developing in very different ways, and even more variety may be expected as time goes on. The relations between the new kinds of school and the grammar school are likely to be formed in a spirit of give and take, and much will depend on the closeness of their partnership; many schools have already begun to realise this in practice. It is impossible to comment on the ultimate form which secondary education is likely to take, just because there is never likely to be an ultimate form; evolution is going on all the time. Whether the grammar school keeps its present form or not, the love of good learning which it has always stood for must be handed on to the boys and girls whose abilities qualify them for hard intellectual study and high thinking. If its teachers maintain their belief in such things as elements in the good life, and if in their actual work they are able to express this conception in a way that their pupils can follow, they need not fear for the future.